This new robot arm video, seemingly from UK-based multinational prosthetic manufacturer RSLSteeper, has been floating around the tubes the past few days. Factual information on its name & origin has been sparse, and some have been calling it the rather pejorative Terminator Arm, but it’s actually an advanced myoelectric prosthetic called the Bebionic3. Known to cybernetics dorks but kinda under the everyday radar, it was officially released in September of this year. 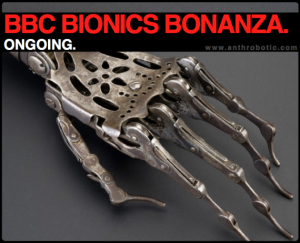 Bebionic3 maker RSLSteeper has been around for over 90 years, but marketing seems to be a relatively recent endeavor. The copy on their site is kinda sticky & self-congratulatory, and it kinda feels almost like parody. Most of their promo videos are just pure Velveeta, but they, or someone, have kinda nailed it with this latest one. 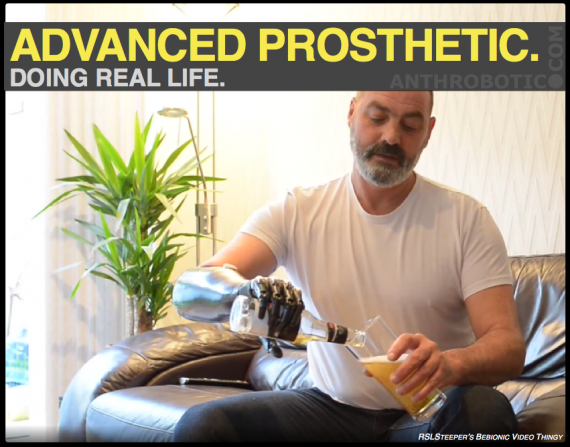 See, now that regular everyday guy Mr. Nigel Ackland has used his robot hand to pour some beer in front of a camera, the Bebionic3 name has really gotten out… kinda. You have to listen very closely to what he says about the device at about 00:10, and that’s when you hear the Bebionic3 name. 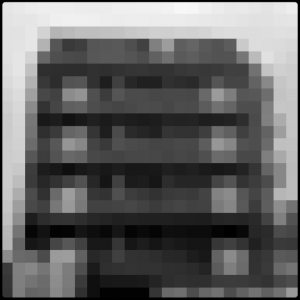 Thereafter, no company logos or branding appear in the video, and the video doesn’t appear on the company website. So, this could just be Nigel YouTube-ing his obviously fantastic Beer Arm, or RSLSteeper’s effort toward post-modern ambiguity-based inverted meta-marketing or something. Either way, well done. You should also check bilateral amputee artist Celso. He’s got two Bebionic3s, and his penmanship shames us all. 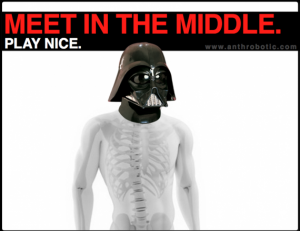 But Anthrobotic wins, too. Fundamental to the larger mission here is actively bridging between technologically curious to moderately dorky citizens and academics, engineers, and specialized journalists. Doing that and being a perhaps semi-unwitting promotional tool is a win-win. But they totally should have cross-marketed with the beer company.